The fluorescence spectra of historical and model paper samples, previously irradiated with the laser beam at wavelengths of 1,064, 532, 355, and 266 nm, are recorded under excitation at 266 nm, and the nonirradiated samples are used for reference. 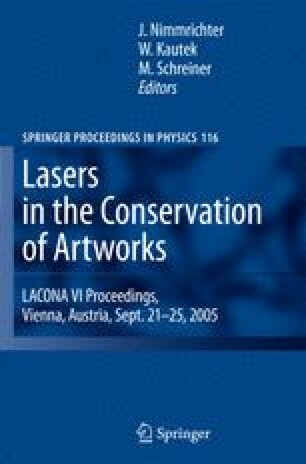 The spectral profiles obtained for the laser-treated model papers made of cotton and/or linen only reveal differences compared to the reference ones. After irradiation at 532 and 1,064 nm, a decrease of the band intensities of the entire spectral profile is observed. In contrary, the UV irradiation at 355nm of the same samples results in the increase of bands centered at 341 and 370nm compared to the visible region only. Prolonged treatment at 266nm results in the marked increase of band intensities in the visible region and corresponds to the independently observed yellowing.